As a teenager I was religious about washing my face each night. Never (ever!) would I have considered going to bed without using my Neutrogena cleanser bar and then dutifully applying toner and copious amounts of Oil of Olay with SPF. I’m pretty sure I’m showing my age calling it ‘Oil of Olay.’ It was all my mom ever used, and I grew up loving that smell. Fast forward a few years, and I now routinely commit the skin care sin of not washing my face at night. Terrible, right? I have a host of excuses: I didn’t even wear makeup today! It will just dry out my skin! Who needs to exfoliate? 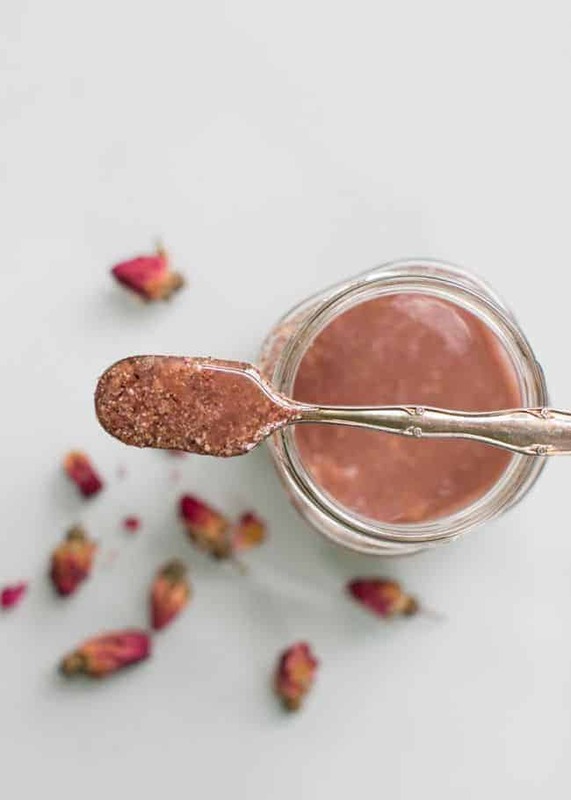 Then I made this rose and chamomile scrub with oats, honey and almond oil and am totally sold on using it every day. 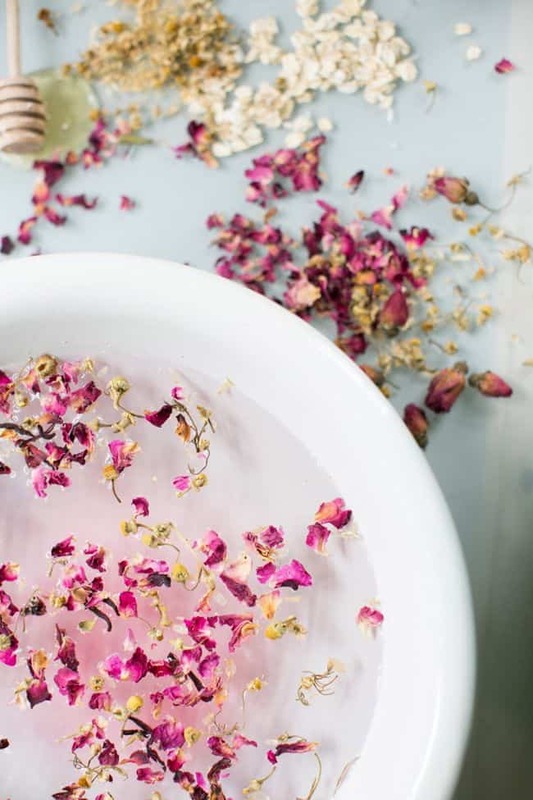 You can find dried rose petals and chamomile in the bulk section at health food stores. And get this – it’s not even expensive! A couple of tablespoons of rose, chamomile and hibiscus flowers were 80 cents at Whole Foods. I’ve never found anything that cheap at Whole Foods! I chatted with a gal getting dried roses for tea and learned that they have lots of vitamin C and contain pectin, malic and citric acids. And dried chamomile is commonly used in skincare for soothing irritated, dry skin. Combine the dried flowers and oats in a coffee grinder and pulse till finely ground. Transfer to sealable container and add honey and oil. Dip a clean spoon into the jar and put a small amount in your palm. Gently apply the scrub using a circular motion and rinse with warm water. If kept sealed and no water gets into the jar, the scrub can last indefinitely. The scrub is mild enough to use several times a week. With my extra flowers I tried a steam. Heavenly! Bring 2 cups of water to a boil and add a handful of herbs and let them simmer for 2-3 minutes. Remove from the heat and use a towel to cover your head (just don’t get your face too close!) for about 5 minutes. The steam hydrates skin and loosens debris in clogged pores so when you’re finished it’s a perfect time to follow up with the gentle scrub. 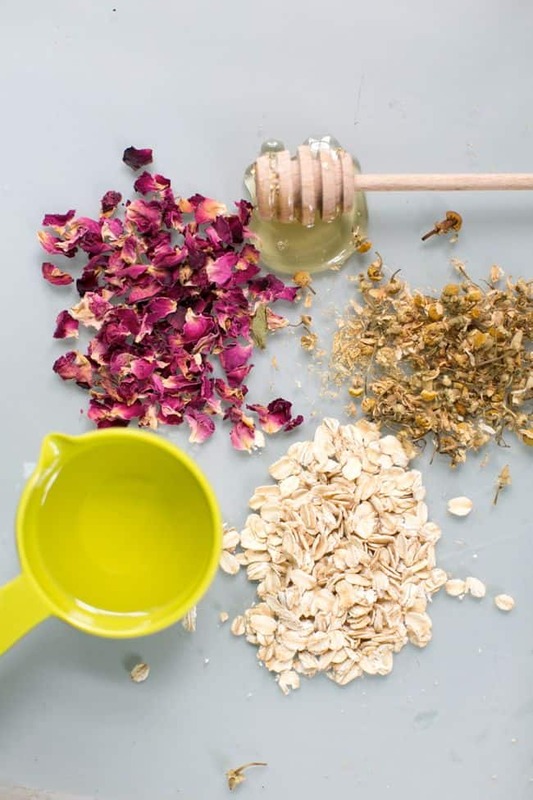 My ‘mature’ skin loves this – the oats and dried flowers exfoliate while the honey and oil add moisture. Sensitive skin would love this too, just make sure to test a small patch first. What is the shelf life for this facial scrub? Does it need to be refrigerated? Just tried this and it made my skin so soft immediately! I used rose hips instead of petals (or are they the same thing?) and may not have ground them enough but I was gentle. My honey is also pretty crystalized so it didn’t blend totally well yet. Even despite all that, amazing! Do you think that I could use Coconut Oil instead? I don’t really like the smell of sesame oil and I don’t like almonds. Can you maybe show how to store it? (or point me to the right page where it shows this? Thank you! This looks divine!